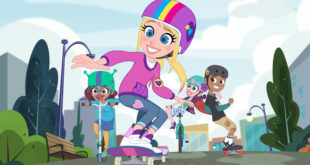 Based on the hit Mattel toy brand, the new Polly Pocket series follows Polly and her friends as they embark on big scale adventures in their shrunken size. Produced by Mattel and DHX Media, the animated series premiered in Canada this July. As part of the brand's relaunch celebrations, British-American designer, Mimi Wade has taken on inspiration from the Polly Pocket phenomenon to create a Polly Pocket x Mimi Wade capsule adult clothing collection and jewellery line.